Suited for use by homeowners and small landscaping contractors, Quick 36 series commercial-grade, walk-behind mowers incorporate infinitely variable-speed hydrostatic drive with instant reverse. Other features include 36 in. wide, 3-blade deck with mulching and bagging options; 13 hp Briggs and Stratton Intek Commercial Spec Engine; and electric start with recoil backup. 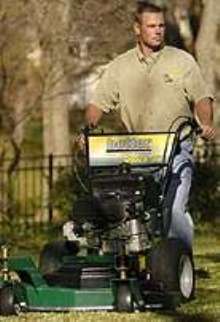 New Quick 36 Mower Combines Professional Capabilities With Affordable Price.